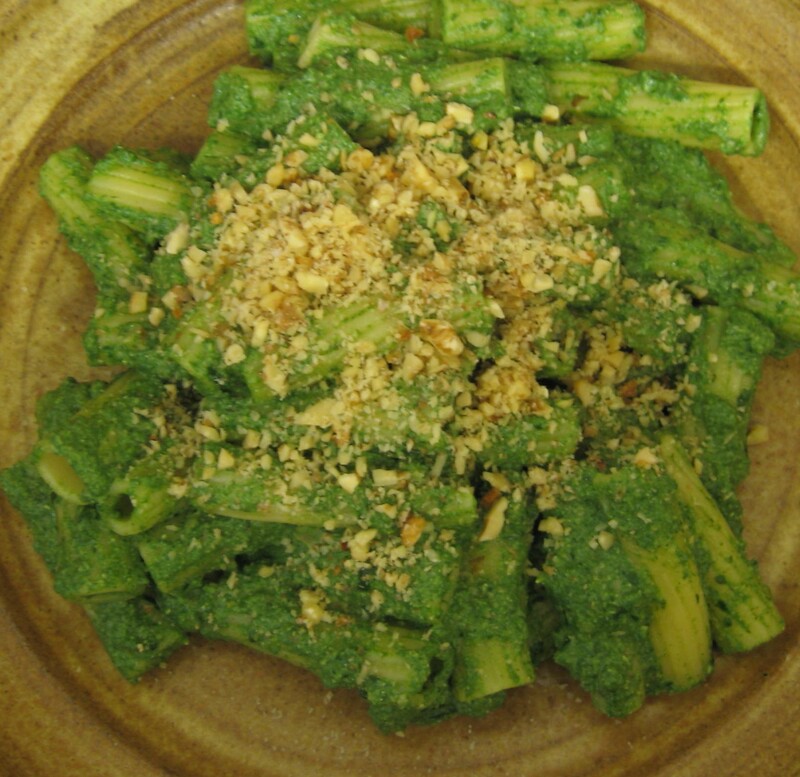 It felt much chillier yesterday evening so we had a big bowl of pasta with this incredibly green and rich tasting spinach and walnut pesto sauce. If I’m honest there was probably enough sauce for 4 people but we ate it all because we are greedy (and it tasted nice). It does help to have a hand blender to make the sauce smooth, but I’ve made it before omitting the ricotta and using a soft cream cheese instead which worked fine. 200g of spinach leaves (green grocers often have big bags of these) washed and drained. If you are using fresh pasta you need to prepare this sauce before you cook your pasta. If on the other hand you are using dry pasta then you can prepare and cook it while your pasta is cooking. Put a splash of live oil and a knob of unsalted butter in a large pan, allow the butter to melt. Add the washed and drained spinach and put the lid on and allow to wilt for a few minutes. Finely chop the walnuts. Check on the spinach, give it a gentle stir and allow it to cook down for another minute. Add half the walnuts to the spinach and stir. Remove from the heat and stir in the ricotta cheese. Using a hand blender, whizz the spinach, ricotta and walnuts together so that they form a thick, bright green sauce. Taste, and add more salt and pepper if you like. Drain the cooked pasta, saving a little of the cooking liquid. Transfer the pasta to the sauce and coat well. If the sauce is too thick you can add some of the pasta’s cooking liquid. Sprinkle the remaining chopped walnuts on top before serving. In the summer I made a version of this with half spinach and half watercress and it was great, we had some left over and I used it spread on toast with some goats cheese on top for lunch.